In the dam's reservoir there is a set of islands that were formed when the reservoir submerged the surrounding areas. The islands with the Banasura hills are in the background view. 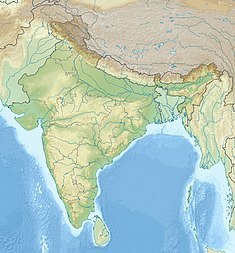 It is the largest earth dam in India and the second largest of its kind in Asia. The dam is made up of massive stacks of stones and boulders. The Banasura Sagar Dam is located 21 km from Kalpetta, in Wayanad District of Kerala in the Western Ghats. It is the largest earthen dam in India and the second largest in Asia and a starting point for hikes into the surrounding mountains. It is an important tourist attraction. Banasura Sagar Dam is at the foot of the Banasura Hill. The Banasura Sagar Dam is named after Banasura, the son of Mahabali who as per local Hindu mythological belief was a very respected king of Kerala. The dam has become a popular tourist destination. Many people visit the place to go trekking at the Banasura Hill & speed boating at Banasura Sagar Dam. The Banasura Hill Resort, located about 20 km from the dam was rated as Asia's largest Earthen Resort by BBC. Speed & pedal boats are available & are major hits with tourists. Speed boat ride, in particular, is an exhilarating experience & not to be missed. The actual missions for this dam is to provide water for Kakkayam dam which was situated in Kozhikode district to produce electricity and also irrigation in Wayanad, both missions were not accomplished and currently it's been part of the Hydel project. It has India's first Solar Atop Dam. ^ "Government of Kerala Tenth Five Year Plan 2002-07 Report" (PDF). Government of Kerala. Retrieved 2006-10-18. ^ "Wayanad outdoor trails". wayanad.org. Archived from the original on 23 October 2006. Retrieved 2006-10-14. ^ "Wayanad". Fast Finder Kerala. Archived from the original on 2007-09-29. Retrieved 2006-10-14. ^ a b "Banasura Sagar Dam". Retrieved 2013-02-11. ^ "Statistical Data". Kerala Government. Archived from the original on 2006-05-28. Retrieved 2006-10-14. ^ "Places of Tourist Importance". Wayanad Government. Archived from the original on 2006-05-05. Retrieved 2006-10-14. ^ "Kakkayam Dam Reservoir - Wikimapia". wikimapia.org. Retrieved 2015-12-16. Wikimedia Commons has media related to Banasura Sagar Dam. This page was last edited on 21 January 2019, at 06:03 (UTC).